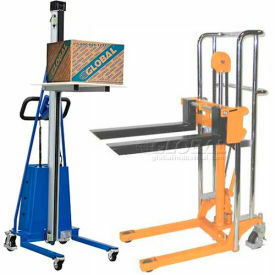 Office & Laboratory Lift Trucks, Lightweight Light Duty Medical Labs Stackers, Portable Hand Operated, Battery Powered Lifts at Global Industrial. 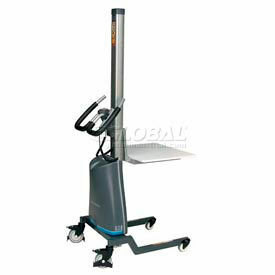 Office and Lab Lift Trucks are designed for Lifting Office Files, Computers and other Light Duty Load Handling Applications. 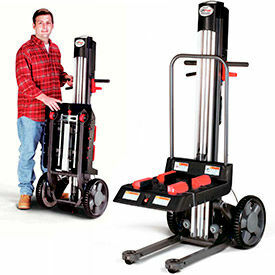 Office and Lab Lift Trucks are solidly manufactured for long lasting durability and dependability. Features sturdy push handles and rugged wheels or rollers for easy mobility and maneuverability in confined spaces. One person can easily load or unload products in warehouses, offices and food service facilities. Available fork and platform types are Battery Powered, Foot Pedal, and Hand Winch Trucks. Load capacities range from 220 to 880 lbs. Dimensions and lift heights vary per model. Magliner® LiftPlus™ Folding Battery Powered Lift Trucks are used for Industrial Sites, Warehouses, Food Service Operations, Offices and more. Magliner® LiftPlus™ Folding Battery Powered Lift Trucks are solidly manufactured for long lasting durability and dependability. Portable Stacker fits through standard doorways for easy load transport and folds up for compact storage. Features unique screw drive mechanism, easy-to-use hand operated controls, overweight indicator light and 12V battery and charger. 13" rubber wheels and 2-1/2" swivel front casters provide easy mobility and maneuverability. PrestoLifts™ Lift Stik™ Office & Lab Lift Trucks feature a Narrow Mast Design and a Short Wheelbase that provides Optimal Visibility & Maneuverability! Presto Lift Stik Trucks are the most versatile Lifters and Transporters on the market. Sleek, attractive and user-friendly machines are used for use in test and measurement stations, office supply rooms, electronic assembly areas and computer server rooms. Continuous lifting chain provides smooth starts-stops and precise load positioning with zero drift. Enclosed aluminum mast and sealed motor cover offer a clean design, allowing it to be used in laboratories and offices with no risk of hydraulic fluid leaks. Oversized ergonomic "sponge-grip" handle provides operator comfort. Two speed pressure sensitive lift control is conveniently mounted on the handle and features a coiled cord for remote operation. Durable powder coated steel frame and fixed steel forks with a ½" thick removable UHMW polyethylene platform are designed for years of service. Battery status indicator and onboard 115V quick-charge battery charger included. Office Lift Trucks roll smoothly on non-marring gray rubber wheels (2 swivel steer wheels with brakes and swivel locks for straight line movement; 2 swivel load wheels). Limited 2 Year Limited Warranty. PrestoLifts™ Lift Stik Narrow Mast Lift Truck PLS60-220 220 Lb. Cap.